This is BIG news in the world of Barbecue. 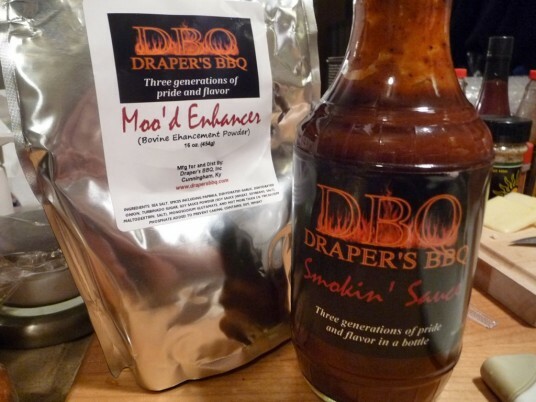 Draper’s BBQ has just launched his newest rub for beef – Moo’d Enhancer. Building on the success of his DBQ Smokin’ Sauce and A.P. Rub, Shane Draper has done it once again, and created what may be the de facto beef rub for brisket, burgers, beef ribs and all things that used to “Moo”. Yes, Moo’d Enhancer (Bovine Enhancement Powder) has been created solely for enhancing your beef cookouts. While Moo’d Enhancer got its start as a brisket rub, it morphed numerous times in development towards an overall spicy and almost “umami” flavor profile that lends itself to a much broader use. It will be just as useful and welcome in the home cook’s pantry as well as a strong contender for space in the competition cook’s arsenal. And to emphasize that last fact, I’ve enlisted the help of an award-winning KCBS Competition team owner, our friend Kit Rudd of Degüello BBQ, to offer his opinions, as a professional BBQ competitor on this remarkable new rub. What follows is my review as a backyard griller, and Kit’s review as a KCBS competitor. Chipotle peppers, chorizo sausage, chili sauce in meatloaf. Yup, it’s that kinda good! I’m so sorry I don’t have a picture or image yet, but … Wow! Did Wifey find a great, spicy alternative to the usual “Italian style” meatloaf we all know and love. This recipe is courtesy of everyone’s good friend Emeril. (Just try sitting in on his show, without a 2 year waiting list, IF you’re lucky). We did make a few substitutions and changes, as we did not have all the ingredients on hand. But the “Star of the Show” was the glaze… a finishing sauce if you will. Sweet, candied, spicy and oh so good. Whisk, blend, or process this messy goodness and spread 2/3 over the meatloaf before baking, reserving the remaining 1/3 for a “dipping sauce. Yea, right, tell you what, I’m dunking my meatloaf slices. Where’s that “more” spoon? Even tho it was our first try with a “mexican” spiced meatloaf, it won our hearts over… especially with the glaze. Back to the original recipe – we did not have the poblanos on hand, nor the Emeril’s Southwest Essence, but we made do with chili powder, cumin, and Melissa’s Fire Roasted Red and Green Chiles. As for Emeril’s Essence… his basic essence is on his site, and it really is a great spice combo. It’s easily made at home. Try this kicked up meatloaf for yourself… it’s a great time of year for meatloaf, and hot and spicy is always a good thing. Have you ever ventured beyond the traditional meatloaf and spagetti sauce? If so, let me know how and what you made.